CCH’s report was released as its HomeWorks campaign joined the city of Chicago in April to announce the city’s new school-based housing initiative. The program will offer permanent housing and support services to 100 homeless families attending six Chicago Public Schools (CPS) located in high-crime communities. By November, 75 families were identified as qualifying for permanent housing through the program, known as Housing Support for CPS Families in Transition, or FIT. FIT is the first city-funded housing program to include homeless families who live doubled-up in the homes of others, often in overcrowded and unstable conditions. FIT is assessing the most vulnerable among almost 300 homeless families with children attending six CPS grade schools on the South and West sides: Charles Earle, Edward Ellington, Julia Ward Howe, James Russell Lowell, Lillian Nicholson and Laura Ward schools. To assess the size of Chicago’s homeless population, CCH developed a new methodology using U. S. Census data. This method also provides a more precise understanding of how many families are doubled-up. The report shows that 82,212 people were homeless in Chicago in 2015, an unduplicated count. 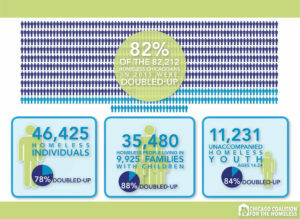 Eighty-seven percent of homeless families (8,634 families) with children were doubled-up. CCH also found that 44% of homeless families served by the emergency shelter system had lived doubled-up with friends or family, either prior to or after entering the shelter system within that year. This shows that many families experience both types of homelessness, cycling in and out of shelters and the homes of others. Chrishauna Thompson’s family became homeless after her mother suffered a back injury, making her unable to work her two caregiver jobs. Over the next four years, Chrishauna, 17, changed schools nine times as her family doubled-up with different relatives. 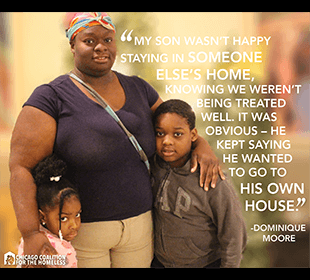 “Most of our families have spent years without secure housing, sleeping on couches or floors, never sure if they’re going to have a place to stay the next night,” said LaTanya Gray, Senior Director of Early Childhood for the Primo Center for Women and Children. Newly relocated to the South Side, the Primo Center provides housing and services to over 500 homeless families in Chicago a year. The HomeWorks campaign gratefully acknowledges project-specific grant support from The Chicago Community Trust and the Polk Bros. Foundation.